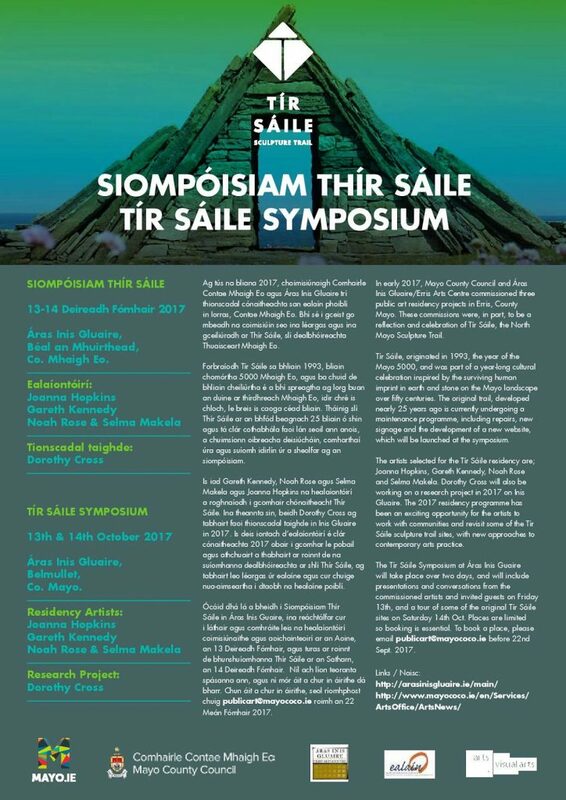 On 13th-14th October, the Tír Sáile Symposium, a unique two-day event, will take place at Áras Inis Gluaire/Erris Arts Centre (in conjunction with Mayo.ie, Mayo County Council, Áras Inis Gluaire, Belmullet, Ealáin na Gaeltachta and Arts Council Ireland). 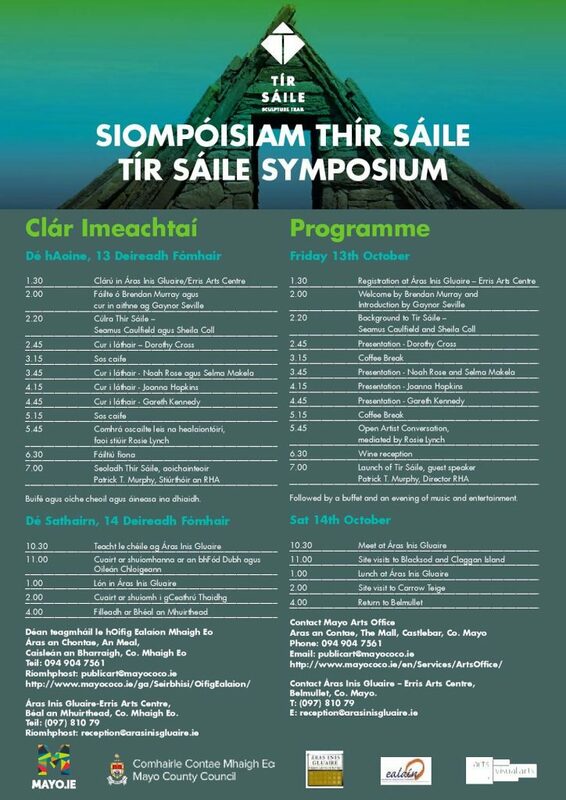 A very special occasion and celebration for Mayo people, and for all those who love history and heritage, awaits. Visiting the Tír Sáile Sculpture Trail in Mayo North is one of the most special things we can do in this part of the world. It celebrates our past and opens our imaginations up to life in this place before us. Tír Sáile is a unique and special sculpture trail in Mayo North, which celebrates and signposts 5,000 years of history in this place, a history made within the landscape. The Sculpture Trial started in 1993, during the year of Mayo 5000, and it was part of a year-long cultural celebration inspired by the surviving human imprint in earth and stone on the Mayo landscape over 50 centuries. Early this year, 2017, Mayo County Council and Áras Inis Gluaire, Belmullet/Erris Arts Centre commissioned three public art residency projects in Erris, Co. Mayo. Part of the idea behind the commissions was to reflect and celebrate Tír Sáile, the North Mayo Sculpture Trail. 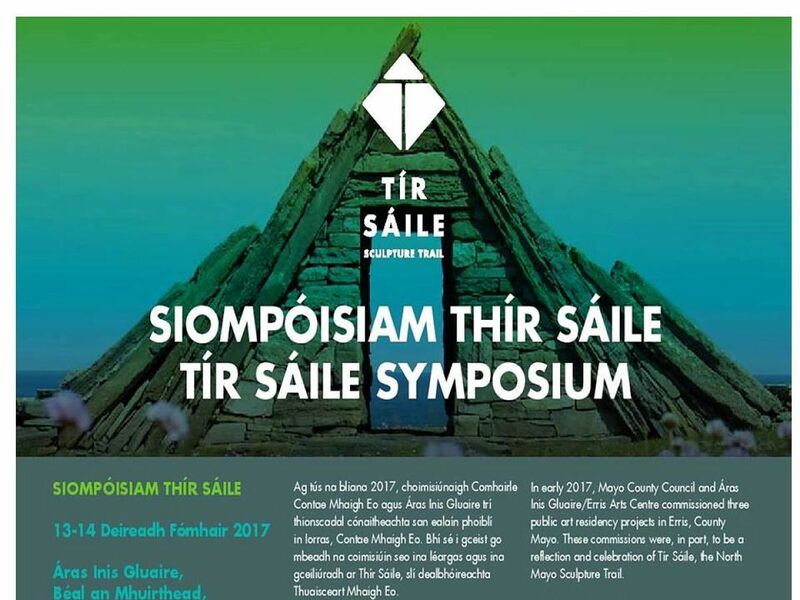 The Tír Sáile Symposium in October presents talks by commissioned artists who are producing work and reflection inspired by Tír Sáile, as well as contributions by guests and it offers chances to visit some of the original Tír Sáile sites. Location: Áras Inis Gluaire/Erris Arts Centre, Belmullet, Co. Mayo. For further information: check out the fantastic two-day programme below and book your place. We hope you can be there for two days of celebration to remember.